Facebook is “the Social Network”. Launched in February 2004 and reached more than 500 million active users in July 2010, it is now arriving to 1 billion users in 2012. Every user can add people as friends, send them messages, update their personal profiles to notify friends about themselves, use applications and join groups or networks organized by workplace, school or college. A big news of end of 2011, is the Facebook “Timelime” : your life is caught in a sort of diary, where your friends can post comments, see photos and interact with you. Considered the huge numbers of Facebook, it is then possible to make money by promoting and marketing your product or service. And if you are good with programming techniques, you can even earn creating Facebook applications. Facebook offers unique tools that can help you build traffic to your site and make money for your business : for example buying ads to advertise your service, linking your business in your profile or creating a page or group especially for your product. See if any of the suggestion below can be suitable for you. 7 – follow the progress of your campaign and check the results. This is simple : just link to any new blog posts you make, new products or new service from your business. Explain the link about your post, with comments and the right information. Of course do not spam or any of your contact will soon hate you ! Another way to make money with Facebook is creating a group or a page, especially for your website, blog or business. For istance, in order to create a page, you may go first to another page that has already been created, related to your business. At the left side of the screen, scrolling down, you will see the link to create your own page. 5 – network with groups and members daily. Keep an active presence on Facebook so that people can identify with your business, blog or website. If you are familiar with programming skills, this is the best way to make money with Facebook. The creators and developers of some of the most popular Faceook applications games as Mafia Wars, YoVille, FarmVille or Texas HoldEmPoker have made millions dollars in revenue thanks to this business. If you wish, take a look to Fill My Money Box page in Facebook. Have fun with Facebook and good luck ! It’s surely a great about making money with Facebook. You have mentioned all the important points here to earn decent with Facebook. 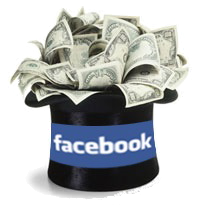 Facebook has so many users that making money with it is really possible. Facebook marketing is the good way to make money online. Start Making More Money As A Freelance Writer By Reading This Advice!